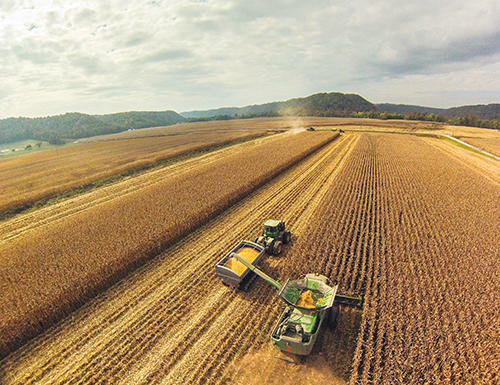 The new U.S. Department of Agriculture census released April 11 shows mid-sized farms in Kentucky farms are on the decline. The new USDA Census of Agriculture is based on data collected from farms across the country for the year 2017. That census is done very five years, so the 2017 state-by-state data is compared to previous statistics from 2012. David Knopf is regional director of the USDA National Agricultural Statistics Service based Louisville. He said the new census confirms a trend in Kentucky that the number of small and large farms are increasing, while those in the middle are disappearing. Knopf said the mid-sized farms tend to go out of business or increase in size so they can be more competitive and take advantage of economies of scale. Kentucky is in line with national statistics that contradict the idea that family farms are fading away. The new census shows that nationally 96 percent of farms are family-owned. Knopf said in Kentucky 93 percent of farms are family-owned. Overall, the new census shows Kentucky’s agricultural industry is growing at a healthy pace, both in dollars and in diversity. Agriculture is a $5.7 billion industry in Kentucky, up from $5.1 billion five years earlier. Knopf said Kentucky’s agricultural industry is on a strong foundation with cattle, horses and poultry, along with the major field crops of corn, soybeans, wheat. Smaller sectors of agricultural production show the diversity and strength of farming in the Bluegrass State, said Knopf. The new census shows that Kentucky farmers harvested 9,000 acres of vegetables for sale during 2017, up from 7,400 acres reported in the 2012 census. Western Kentucky Farmer Barry Alexander doesn’t have an answer on when the Trump administration will reach a trade deal with China, now a year into tariffs that have hamstrung some Ohio Valley industries. Click to hear Liam's story about how small farmers in the region are feeling the impact of tariffs.